The Global Ecovillage Network has made many efforts to address and respond to climate change. Ecovillages employ a range of different strategies and activities for first reducing and then offsetting, mitigating and eliminating their green house gas emissions. Below and at COP21 we highlight and feature some of the best of what is being done in ecovillage communities around the world. While we welcome the efforts of governments to limit global warming to 2 degrees and to adopt a strong binding agreement in Paris, we believe that it is essential that humanity do much better than this. Facing climate change, widespread hunger and the destruction of the Earth’s ecosystems, we urgently need viable ecological solutions and alternatives in order to survive and thrive. These solutions must be tested and optimized before they can be applied on a large scale. We will need to make fundamental changes in how we think and act in our contact with nature: humans must reintegrate into the ecological cycles, adopt climate resilient practices, invest in renewable energy and natural building practices, and focus on restoring the natural environment. Community-based solutions can be fun, low-cost, and inspiring — they lead by example, not by requirement; carrot, not stick. Ecovillages and transition communities can be, and many already are, net sequestering in their ecological footprints — they have gone beyond zero. Now we need the support of governments, civil society and all other stakeholders to replicate and scale up the best of what we are doing. Read on for more about what we have on offer. A delegation of more than 15 members and leaders of the Global Ecovillage Network (GEN) are participating in the COP21 Climate Summit Conference in Paris. We are helping to organize and you can find us at a booth (11B) sponsored by Ecolise in the Climate GENERATIONS Area at Le Bourget. We invite you to come to our Side Event, Ecovillages: 1001 Ways to Cool the Planet, at COP21 on Saturday evening, 5 December or to attend numerous other events that we are organizing or where we will be speaking during the conference and around the city. “Ecovillages have long served a vital function as the laboratories of a resilient future, where solutions are tested, tweaked, adjusted. Sometimes they work, sometimes they don’t, but it’s in the “what if?” spirit that their genius lies. As well as serving as an inspiration to its readers, the book is intended as a learning resource. At the end of each chapter, the editors have given a few keywords, listing some of the best approaches used by each ecovillage, for example, in developing a water treatment facility, building a straw bale house or supporting groups of people in their endeavours. Thousands of ecovillage communities around the world are taking action and responding to the challenges confronting us due to global warming and climate change. These actions range from and focus on developing and implementing Green Building Practices, Climate Friendly Agriculture, Restoring the Natural Environment, Sequestering Carbon and Green House Gases through BioChar and Soil Restoration, Protecting and Regenerating Local Water Cycles, Installing and Using Renewable Energy and Appropriate Technologies, and responding to emergencies and crises with resilient and regenerative planning and rebuilding practices. 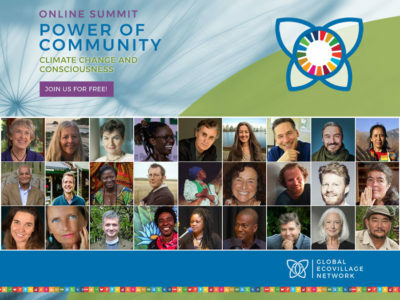 Below we feature many of the best examples of what is being done around the world in ecovillages and by the ecovillage community to do our part in solving the climate crisis – grouped by topic areas. GEN partner organization, Gaia Education, has created an Ecovillage Design Curriculum and offers Ecovillage Design Education (EDE) Training Programmes around the world. The EDEs provide students of all ages with the knowledge and practical skills for designing a society which uses energy and materials with greater efficiency, distributes wealth fairly and strives to eliminate the concept of waste. GEN President Daniel Greenberg recently founded an organization and service enabling people to understand and take responsibility for their carbon footprints. Not to “offset” their travel impact but instead to “pay-it-forward” and support sustainability projects of their choice while increasing awareness and action around climate change. EarthDeeds is partnering with schools, businesses, organizations, camps, congregations, individuals and families to help them understand and account for their emissions while raising funds to support programs and initiatives that are working to prevent, end or even reverse climate change and global warming. EarthDeeds has set up a page for GEN Delegates attending COP21, enabling us to support efforts being undertaken in ecovillage communities around the world to address and respond to climate change. EarthDeeds would be happy to do the same for your organization; however we would also welcome your contributions to support our efforts in our ecovillage communities.